You'll also love this week's photos on the topic of "Kids & Pets" over at Natural Parents Network, inspired by "Parenting Through the Loss of a Pet." You can see our late, beloved Mrs. Pim. It's all heartwarming and tearjerking at the same time. 10. I am Fancy Nancy! 33. Baby wearing on the head? That really makes me laugh .. totally adorable! Fashionable AND practical! What a smart boy! Adorable! He really comes up with such cute things to make you smile! How cute is that! 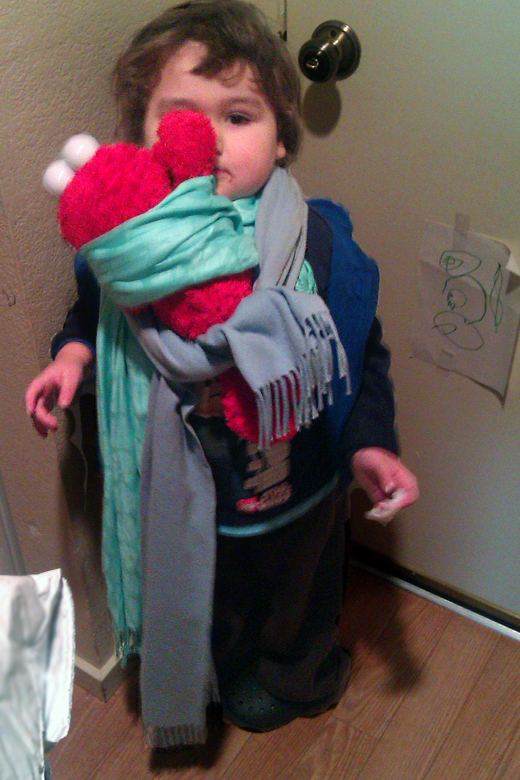 I also have a picture of L wearing his doll in our Maya wrap. That is so cute, it's awesome that you have a picture to remember it with. Your kiddo is unbearably cute. And also quite resourceful! Put him to work carrying the baby after she's born! 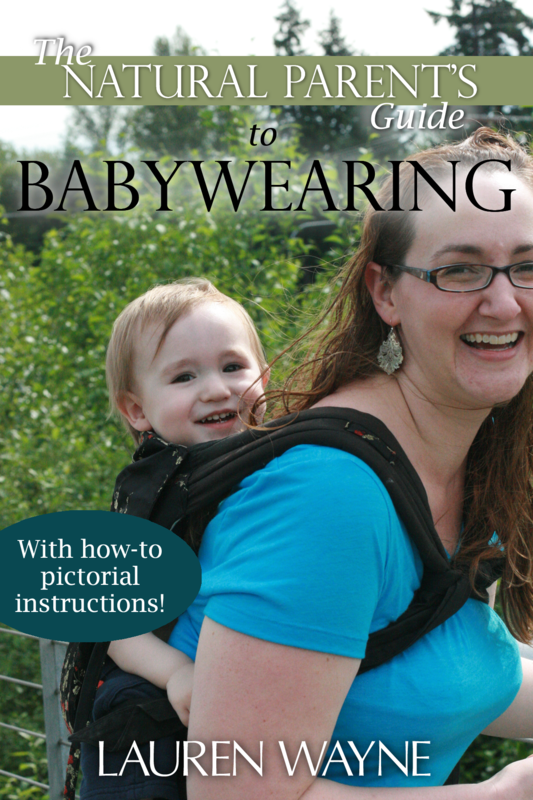 lol I did a babywearing post, too. lol! my two girls have these teeny little backpacks they got as gifts...the big one (3 1/2) showed the little one (23mos) how to wear it: they put the bag part on the front so they can carry their baby dolls in it ergo-style! laughed my head off and felt warm and fuzzy all at the same time. hooray for super cute kiddos who are totally getting the AP message without even knowing there's a message to get. That is really cool. How crafty!! The pediatrician bribed him?? And he can afford to bribe with such a toy? What did he get in exchange? How do you feel about the exchange? Not to judge, I was just surprised by it all... and terribly curious. Adorable photo, as always! Your son is gorgeous! Mikko is such a silly boy! nice dentist to give out Elmo! Mikko must of been very brave. @Momma Jorje It was the children's dentist — actually, the hygienist started it. Mikko has inherited my terribly grooved molars and has had six (SIX! ack!) fillings so far in his baby teeth. (I feel awful about this, of course.) So he's terrified of the "dentist mama," as we call her in our attempt to make her seem less scary. And, really, they do a great job with kids (sit on parent's lap, minimal drilling, very patient, etc. ), but he's just genuinely freaked. He was so pitifully crying at our last visit (just a cleaning/quick check, no painful instruments or anything) that the hygienist, with the dentist's blessing, brought over this Elmo doll (used to talk, I think, but no longer working; it's definitely a used toy) and said he could keep it, then gave him a rubber ducky for good measure, and then gave him a token to get the standard prize from a vending machine (for little cheap toys) that every kid gets. My feelings about it? Honestly, my first thought was, We just decluttered all his toys, and now he's getting more!! Heh. But I appreciated that they could see how upset he was, and I was hoping that his haul might inspire him to think more favorably of the dentist next time he goes. But maybe not! Hey, anything to make going to the dentist a more positive experience. I love it when the kids carry their little ones in their carriers. 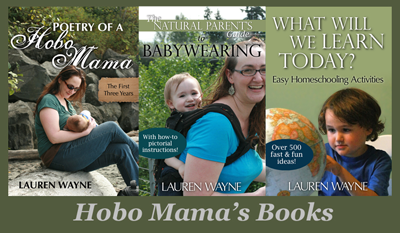 It's so great to see them model the parts of their little life that have been so meaningful! So sweet! I guess it really is a testament to how much children value being snuggled close to their parents!